Buckskin Lederhosen with H-suspenders in Light Brown. These traditional Lederhosen in a subtle shade of light brown are made from soft, supple buckskin: the natural variations in colour give them a weathered, antique effect and they are embellished with embroidery and leather applique. H-shaped braces have a cross-piece embroidered in shades of ivory, yellow and green; ornate silver buckles allow the suspenders to be adjusted for an individualised fit and they are attached to the waistband with decorative buttons. 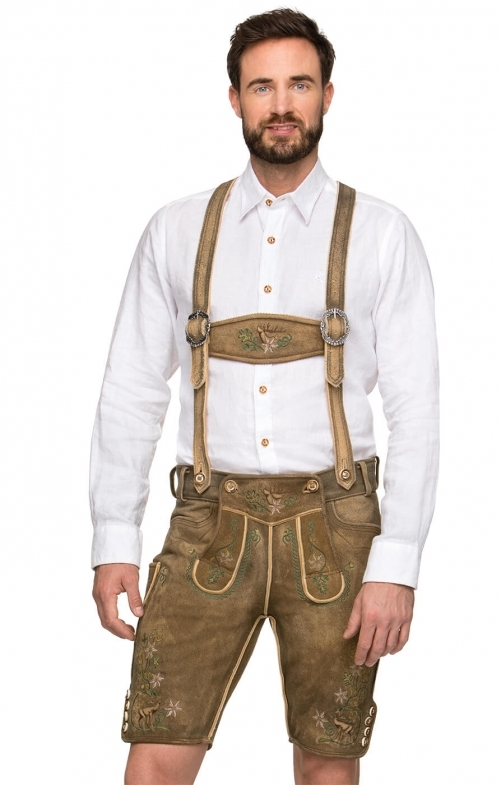 The H2020 Lederhosen are styled with two front pockets and one at the rear. Belt loops are provided for an alternative means of support.